Hvis du skal til Venedig sidst i denne uge på arkitekturbiennale, så kan du høre Rem Koolhaas OMA/AMO fremlægge sit uddannelsesprogram for den nye Kool-As-Hell arkitekskole i Moskva, der går under navnet Strelka Institute for Media, Architecture and Design. Koolhaas vil på Biennalen fortælle om programmets fem temaer: Design, Energy, Preservation, Public Space og Thinning, der er hans bud på temaer som de [nye] arkitekter skal lære at forholde sig kritisk til…og det er pt. især gældende for Rusland. As virtual realms become more popular, physical public space has experienced a simultaneous divestment of attention and potential. It is not only the conflict between virtual and real space that defi nes the nature of public space today, but also the shift from the public to the private sector, morphing formerly free spaces into hybrid commercial zones. When attention is paid to public space, the increase in supervision and surveillance – together with a glut of good intentions in the form of more art, more design – transforms spaces of spontaneity into pre-programmed, overdetermined areas. What comprises public space in Russia? What should be done with the excess of open space produced by monumental Soviet planning? What can be learned from the architecture of improvization that populated these spaces after the arrival of the market economy? Is there a correlation between the heavily programmed nature of 21st century public space and the relative freefor-all of virtual social spaces? This theme examines the current state of public space in Russia in its physical and virtual manifestations. It calls for a reassessment of the open spaces of Russian cities and a committed architectural engagement in the virtual territories created by new media. While our sense of duty (and nostalgia) towards history grows exponentially, actual knowledge and the depth of our memory diminishes. Four percent of the surface of the world is now designated by UNESCO as a World Heritage Site, and while 200 years ago the average age of the sites we preserved was 2,000 years, in 1960 the lag time of preservation was cut to 40 years. Today, modernity coexists with a larger and larger territory that is dedicated to its opposite. Preservation is no longer a retroactive idea, applied selectively to the past, but something we look forward to and accommodate in advance. What do we preserve? How can we deal with preservation within the context of a market economy where architecture and cities are often reduced to marketing tools? How do we preserve urban substance without compromising its vitality and capacity to incorporate changing lifestyles? This theme takes Russia as a case study for addressing and reframing preservation within the global context of the free market. but the density with which they are inhabited is diminishing. Dubai has experienced rapid development, but the occupancy of any new urban substance there hovers around 15 percent. It is not only cities that are undergoing a process of thinning: rural areas are emptying out both as a result of urbanization and the recalibration of small towns and villages to accommodate part-time, urbanite, occupants. Thinning therefore is a process taking place both in cities and the countryside, and as a result both of economic growth and economic stagnation. How does the mobility of Russia’s population shape its urban environments? How is the decline of certain territories connected to growth of others? If people are moving to cities what happens to the places left behind? Demographic and urban thinning is an international issue in which Russia has intensive experience. This theme will formulate a distinctly Russian perspective for a global conversation. From its outward appearances, one could image that design is undergoing a kind of apotheosis. It is referenced as an essential component to nearly every scale of aspiration – ‘from the teaspoon to the city’ – and its most accomplished practitioners are worshipped as heroes by people inside the profession and out. But for all the chances and rewards that this would-be Golden Age promises, the professional life of the architect is typically defi ned by relative weakness and passivity. 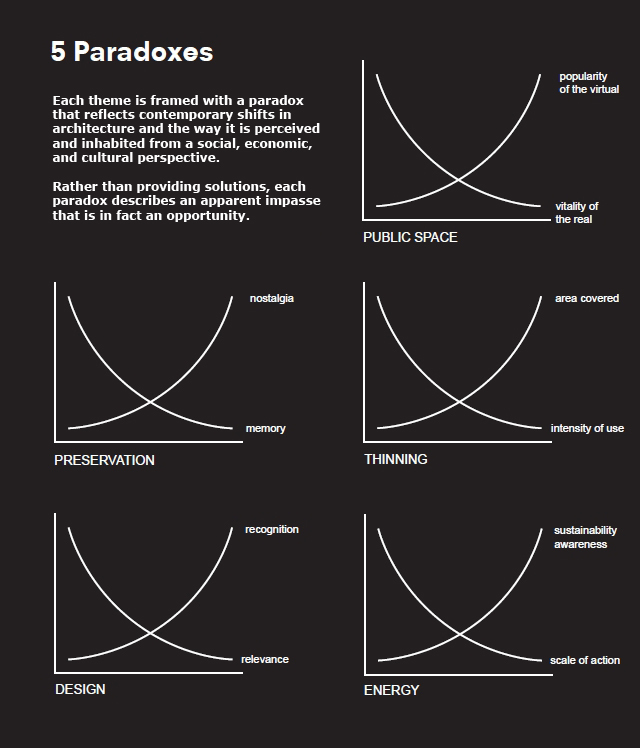 How is design directly impacted by economics, politics, journalism and other fields that support it? And conversely, how do the technical aspects of design transform into tactical devices for marketing, city branding and career manufacturing? Design schools have traditionally taught students how to design, but have not looked at how design actually operates in the world. 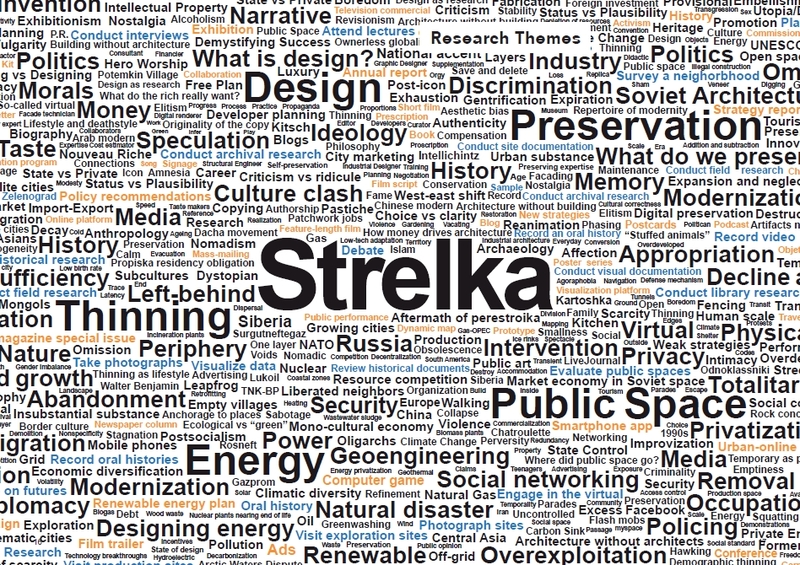 The Strelka design theme will address this inadequacy: over a six-month period, researchers will investigate design in relation to its professional context rather than as a hermetic discipline. exploitation possible. Architecture and regional planning can play a crucial role in this development, but the thinking must extend beyond the comfortable scale of individual buildings. What happens to Russia when its neighbours are no longer reliant on Russian oil and gas? How to diversify Russia’s energy-based economy? How can Russia’s climatic diversity and resource richness be translated into a new approach to power? What is the role of energy in shaping the emerging global order? This theme declares energy as a subject of design and Russia as a platform for innovation. Previous Post Smagsprøve på animationsfilmen "RUBIKA"